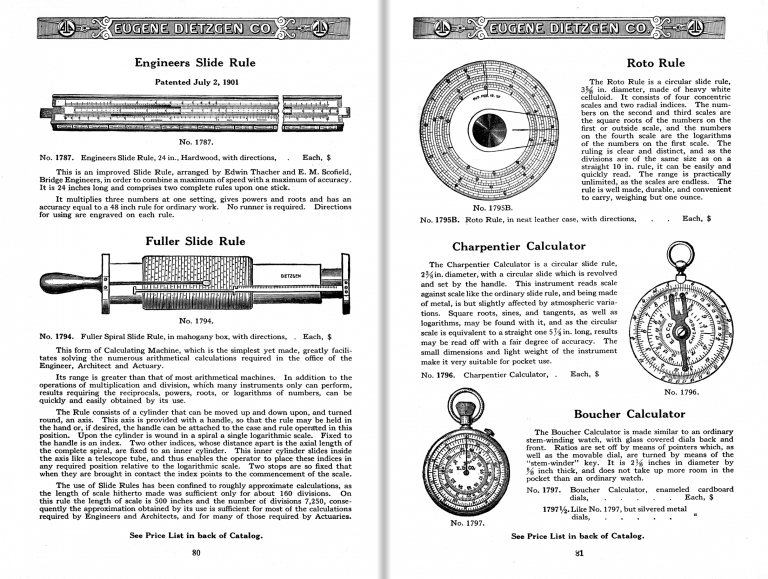 Consider the slide rule: once upon a time, the inescapable shorthand symbol of the engineer. Buzz cuts, pocket protectors, and “slipsticks” were how the public visualized those heroic NASA engineers who got us into space. Slide rule basics – multiplying, dividing, logarithms and roots — were taught in school. Even Isaac Asimov wrote a book about how to use them. They were once that essential — and magical. The basic principle was discovered in the 17th century, but it was in the 20th that they flourished. Eugene Dietzgen started selling engineering and drafting supplies in the late 19th century, soon adding slide rules to his product line. The accuracy of a slide rule is related to it’s size – basically, how close together the numbers can be printed. High school students might get by with 10″ rules, but serious engineers needed more precision. This 2 page spread from 1921 includes a 2-foot long rule as well as a somewhat-unwieldy “Fuller” rule, which because it spun with numbers spiraled around it, massively increased the area for reading out values. In 1970, slide rules were ubiquitous in science and engineering. And in 1980 they were extinct. The slide rule industry was utterly decimated in less than a decade by the introduction of the digital pocket calculator. Now they’re merely collectors items. Fuller-type slide rules are worth hundreds of dollars to collectors. Surprisingly, you can still buy a new slide rule. A company called “Concise” in Japan still makes them. And they’re still kind of magical – if you’re an engineer, anyway.